The country comes in for international criticism after cracking down on activists and their supporters. Three Vietnamese activists were found guilty by a local court of “serious obstruction to traffic” when they rode their motorbikes last February from Ho Chi Minh City to Dong Thap province to visit a former political prisoner. Prominent Vietnamese activist blogger Bui Thi Minh Hang was given a three-year prison sentence while her two other companions, Nguyen Thi Thuy Quynh and Nguyen Van Minh, received jail terms of two years and 2.5 years, respectively. The one-day trial was held six months after the three were arrested. Twenty-one other activists took part in the activity last February but only three were charged for violating Article 245 (causing public disorder). Bui Thi Minh Hang is a popular anti-China activist who is also a vocal critic of the government’s policies on land, religion and human rights. Nguyen Thi Thuy Quynh is a fellow activist-blogger. Nguyen Van Minh is a Hao Hao Buddhist sect follower and an activist for religious freedom. Many believe that Bui Thi Minh Hang was the real target of the police but the two other activists were also arrested to avoid accusations that authorities are unfairly persecuting anti-government activists. More than one hundred friends, supporters and relatives of the three prisoners went to Dong Thap province to show support during the trial, but the police blocked them from the hearing, making further arrests. According to Ngoc Nhi Nguyen, almost all of the visitors had been “stopped, harassed, threatened, barricaded, and even beaten up and arrested by the police.” He reported that anyone taking photos near the courthouse had their phones or cameras confiscated. Many were also arrested and herded inside waiting police buses and taken to an unknown location. “The Vietnamese government is obviously too scared to allow its citizens to even come near the building housing the Court room, let alone allowing them inside to watch the proceed of the supposedly open trial,” he added. There was also another report that some of the relatives were harassed by police the night before the scheduled hearing. The unreasonable long prison sentence and the crackdown on the peaceful protest during the trial were quickly condemned by global human rights groups. They pointed out that the Vietnamese government, as a new member of the United Nations Human Rights Council, should be a model in respecting the human rights of its citizens. 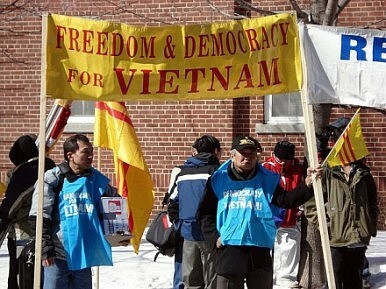 Vietnam has been criticized in the past for its severe treatment of dissident bloggers and pro-democracy activists. The recent prosecution involving a prominent activist blogger and an advocate of religious freedom will likely trigger international outrage, especially from those worried about the country’s worsening state of human rights and free speech. Another act of civil disobedience shows that ordinary Vietnamese are becoming more vocal.